May the Fourth – that special day for Star Wars fans everywhere. It should come as no surprise that DMSAS has its share of “scruffy nerfherders” and “pod-racers.” Though we don’t hang out at seedy interstellar truck stops in Mos Eisley, we, like most fans, do make our personal critiques of the epic plot and fictional universe. This posting will be no different, as we set the debate about the architecture of Star Wars. First, kudos to the unsung heroes of the movies: the set designers, concept artists, and CGI specialists. You are the folks who add those thoughtful backdrops with all the required detailing that give this epic story its true movie magic. One question asked by the movies’ creators, outside of believably scripting characters, was how to engage the viewer in a galaxy from long ago and far, far away. Part of the answer: architectural familiarity. 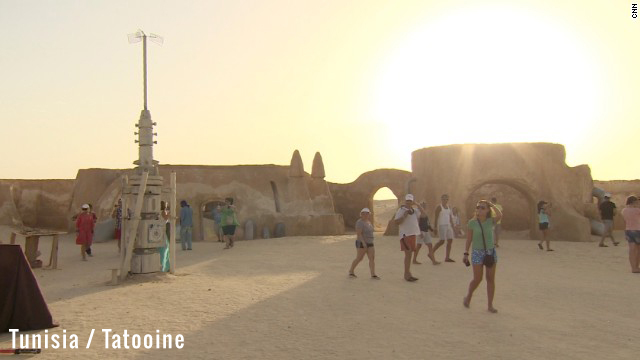 Every die-hard fan knows that Tatooine, Luke’s home planet, is the real-world desert landscape of Tunisia. 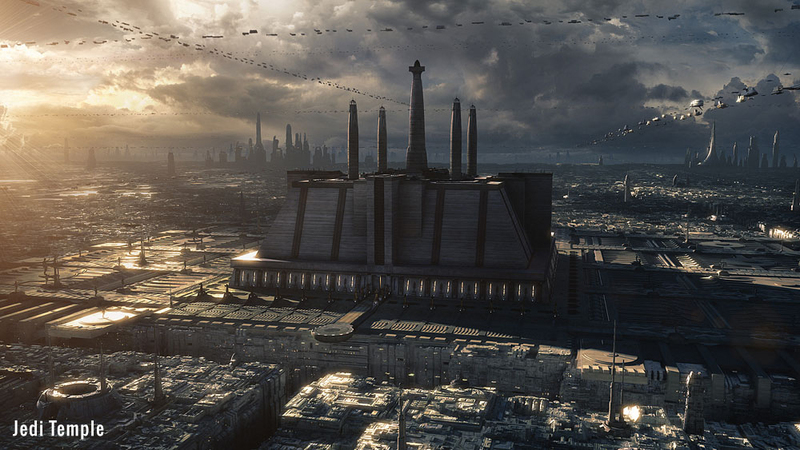 But, did you note the clever mix of Byzantine and Baroque architecture in the capital city, Theed, on Naboo? 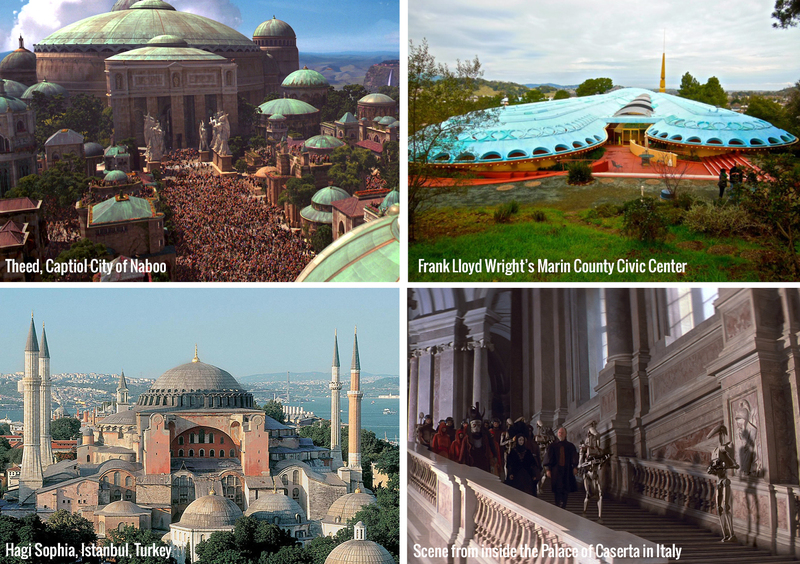 Though the exterior of the Royal Palace might remind one of Hagia Sophia in Istanbul, it was actually directly inspired by Frank Lloyd Wright’s Marin County Civic Center. Scenes of the Palace interior were filmed in Reggia Di Caserta (Palace of Caserta) in Italy. This combination plays to both the civic importance of the building and the stately grandeur of a parliamentary monarchy. What about the brief shot from space of Coruscant? 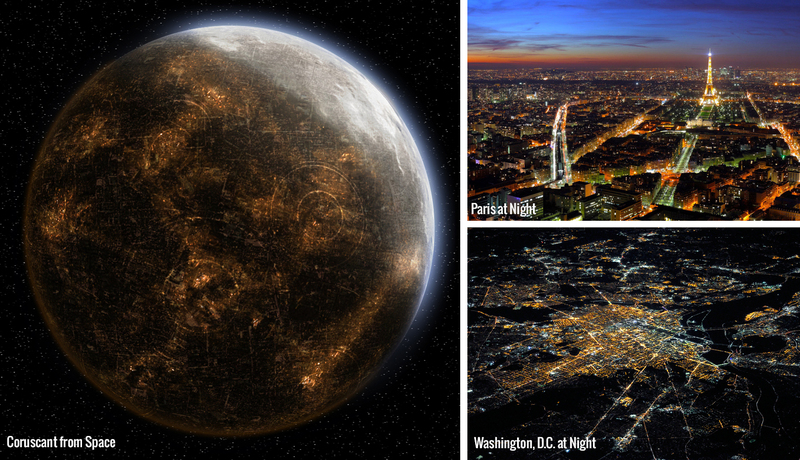 The intergalactic capital planet-city looked surprisingly like Paris or Washington DC at night, with its grand boulevards and public circles. 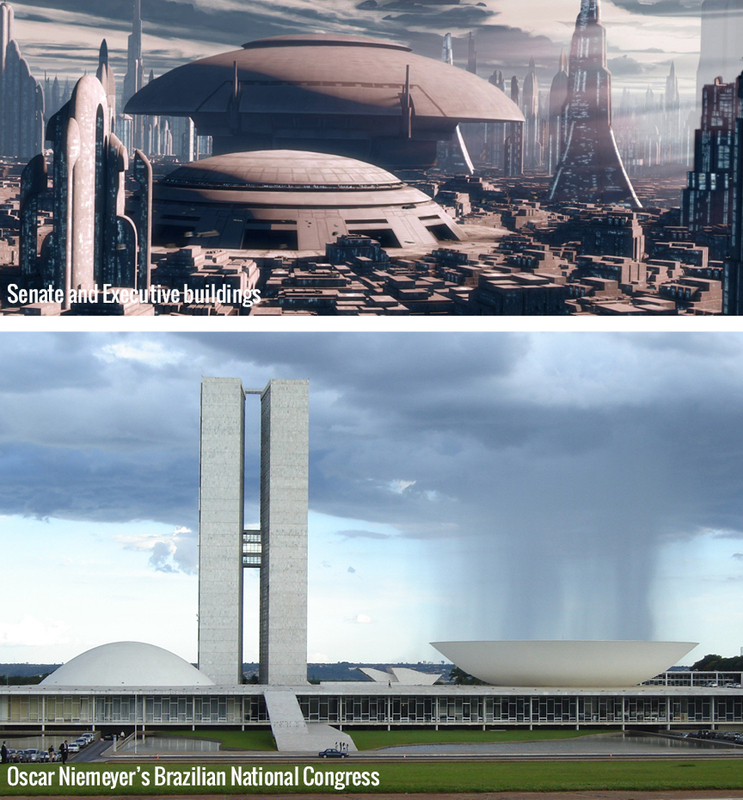 The Senate and Executive buildings are similar to Oscar Niemeyer’s Brazilian National Congress building. The Jedi Temple (later the Emperor’s Palace) is meant to invoke a monastic feel by placing a five-spired temple on a ziggurat base. Clearly, some thought went into how the audience could relate to or recognize a location based on the functional style of the architecture. That was Episodes I, II, and III, before the fall of the Galactic Republic and the Rise of the Empire. Episodes IV, V, and VI followed the Rebel Alliance from secret bases on the ice planet Hoth, aboard Home One (Admiral “It’s a Trap!” Ackbar’s flagship), and eventually the forest moon of Endor. Not too much architecture to speak of on the Rebellion side (even by Marc-Antoine Laugier’s standards), but the simple, almost cliché, interplay between light (good Rebel Alliance) and dark (evil Empire) in all three movies should be noted. Of course, a Star Wars blog posting is not complete without the mention of the infamous Death Star (shown above with its real-life architectural doppelganger, Rem Koolhaas’s RAK Convention Center). Despite its awesome power to destroy whole planets, the Empire built it twice, with the same flaws – a shaft with direct access to the power core and poor defense against smaller ships like an X-wing or, everyone’s favorite 12-parsec Kessel runner, the Millennium Falcon. To be fair, the second Death Star was under construction when it was attacked…but come on, Vader. You have command of the most powerful military in the galaxy and no budgetary limit. Regardless of the epic fails in military architecture and other debatable critiques of Star Wars films, time was given to the appropriateness of the architecture and the correct backdrop of every scene. Personally, I look forward to the next and final(?) trilogy. Now, if you’ll excuse me, I need to go get some power convertors at Tosche Station. If you just can’t get enough Star Wars, we recommend you check out Wookieepedia for seemingly endless Star Wars facts, photos and trivia! The preceding was authored by DMSAS intern architect Eric Kom. Prior to joining DMSAS in 2014, Eric received his Masters of Architecture from the University of Miami.